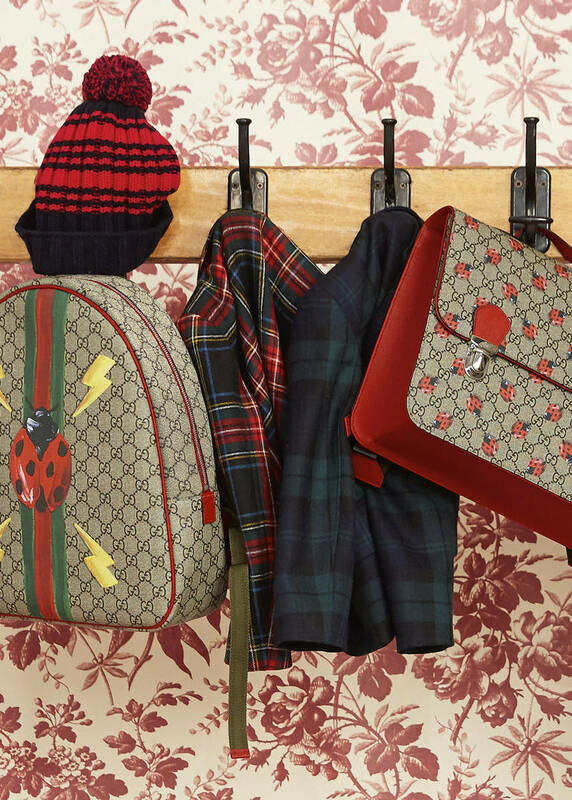 Whimsical motifs from Alessandro Michele’s world detail a back to school collection featuring plaid coats striped knit hats and GG motif backpacks and satchels decorated with hares or ladybugs. 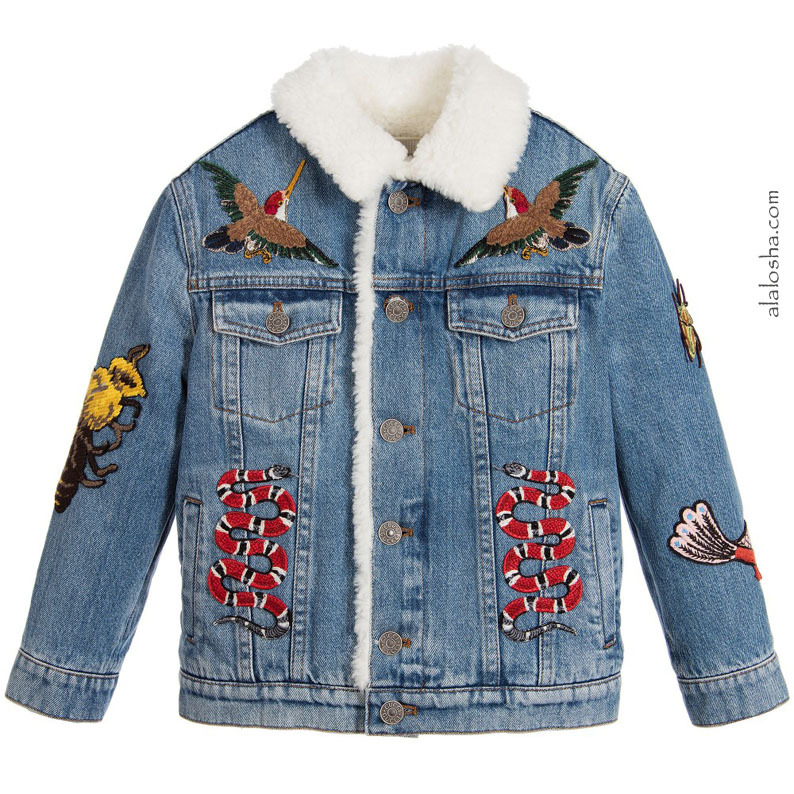 Boys faded blue denim jacket, featuring fantastic embroidered animal appliqués, including snakes, humming birds and bees. 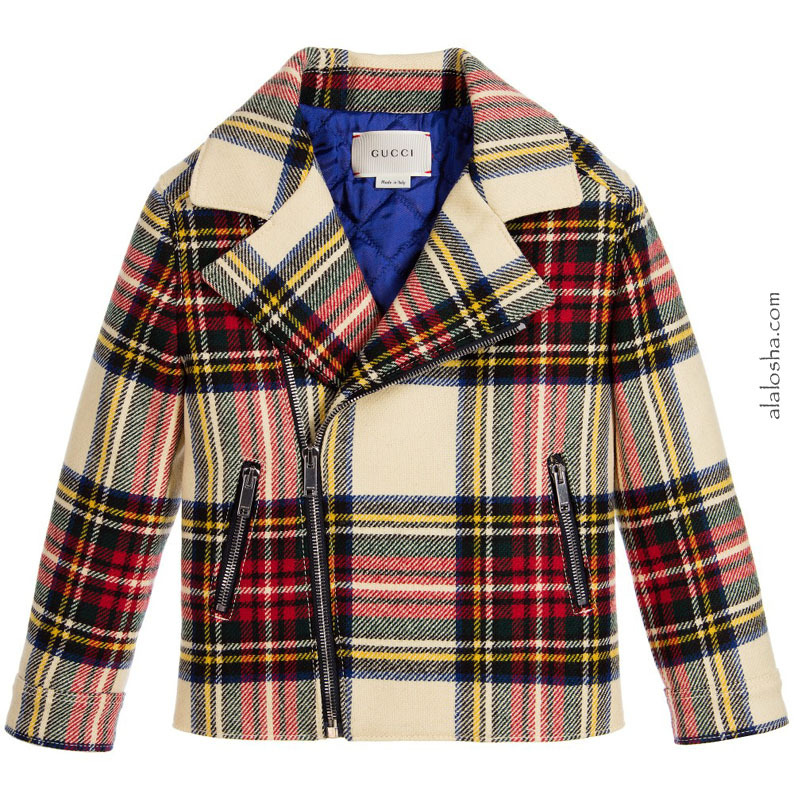 It has a Gucci logo button fastener and matching buttons on two of the pockets. 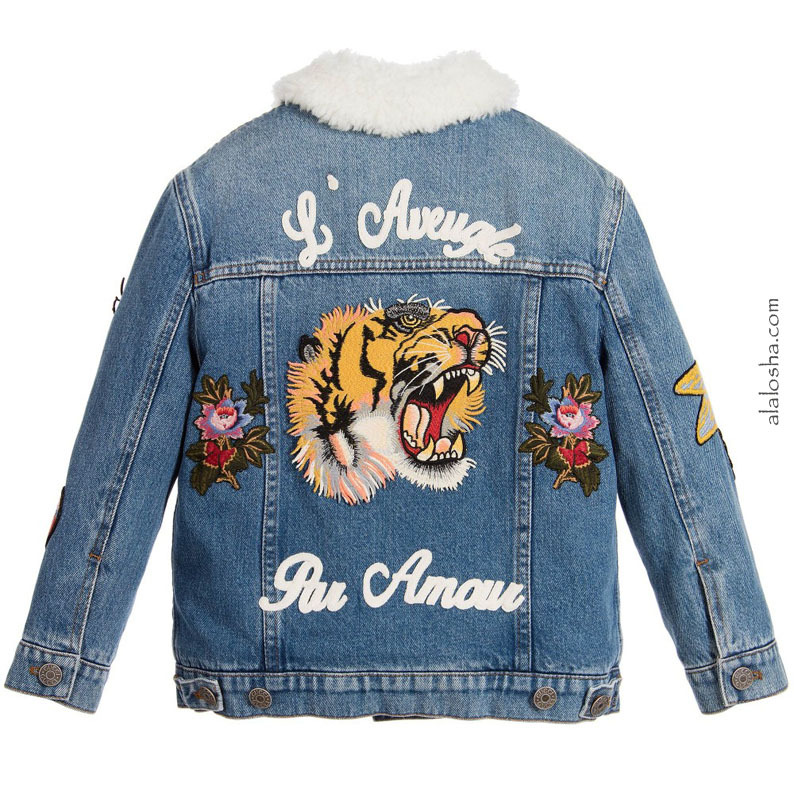 Fully lined in beautiful white, wool-blend fleece, the back has more embroidered appliqués of a tiger and roses, with the words 'L'Aveugle Par Amour'. 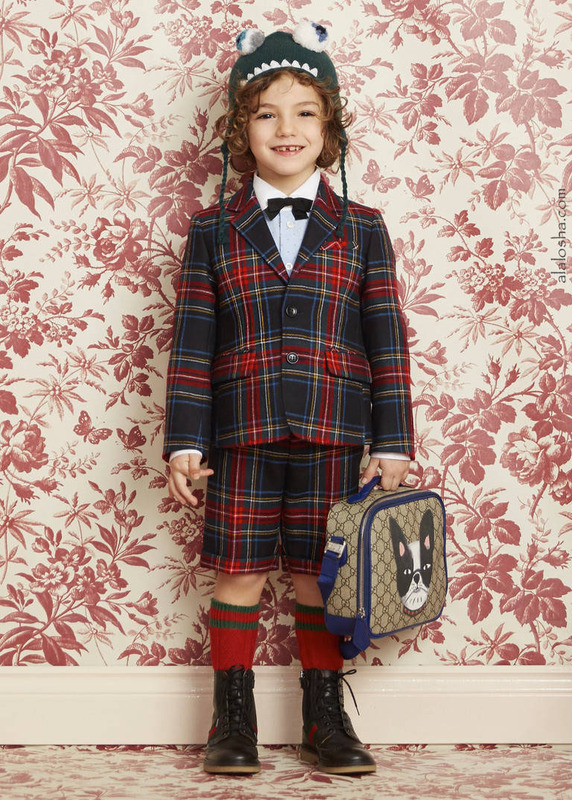 Boys beige tartan, woollen jacket with red, blue and yellow checks, featuring a zip fastener on one side of the front, with zipped front pockets. There are Gucci logo pull tabs and poppers on the cuffs. 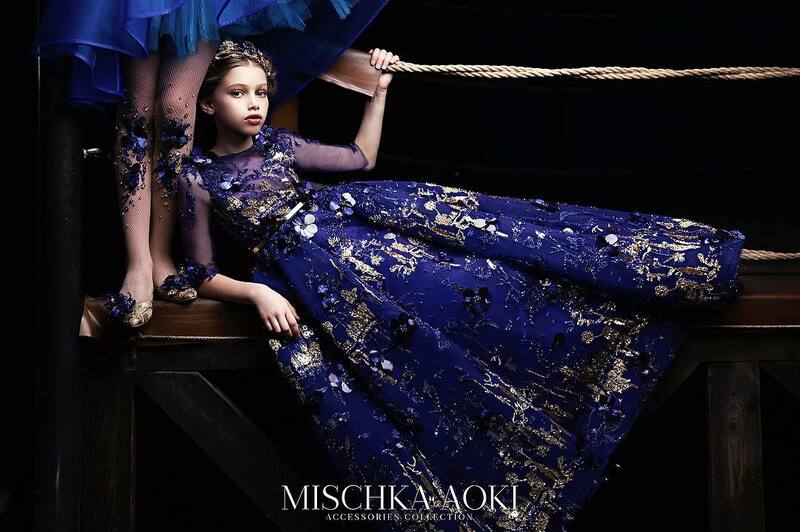 The jacket is lightly padded and has a lovely, quilted, royal blue, silky lining. 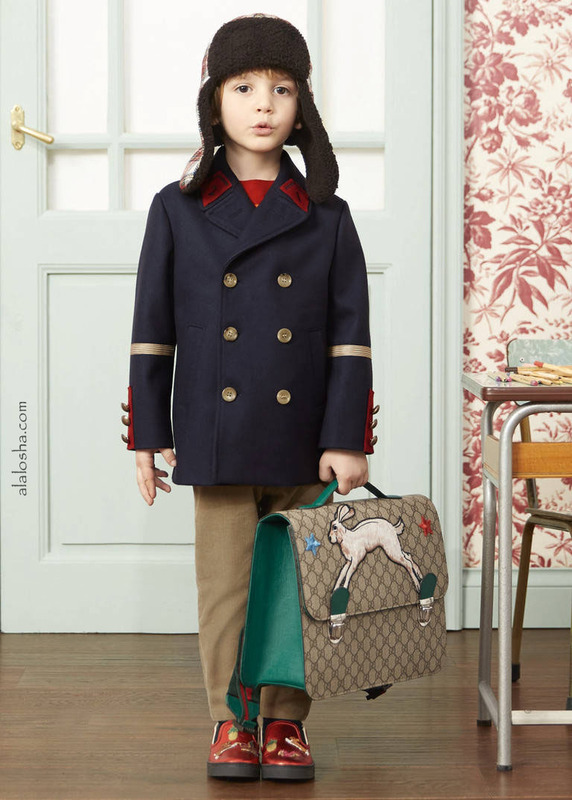 Boys beige, long-sleeved cashmere sweater by Gucci. 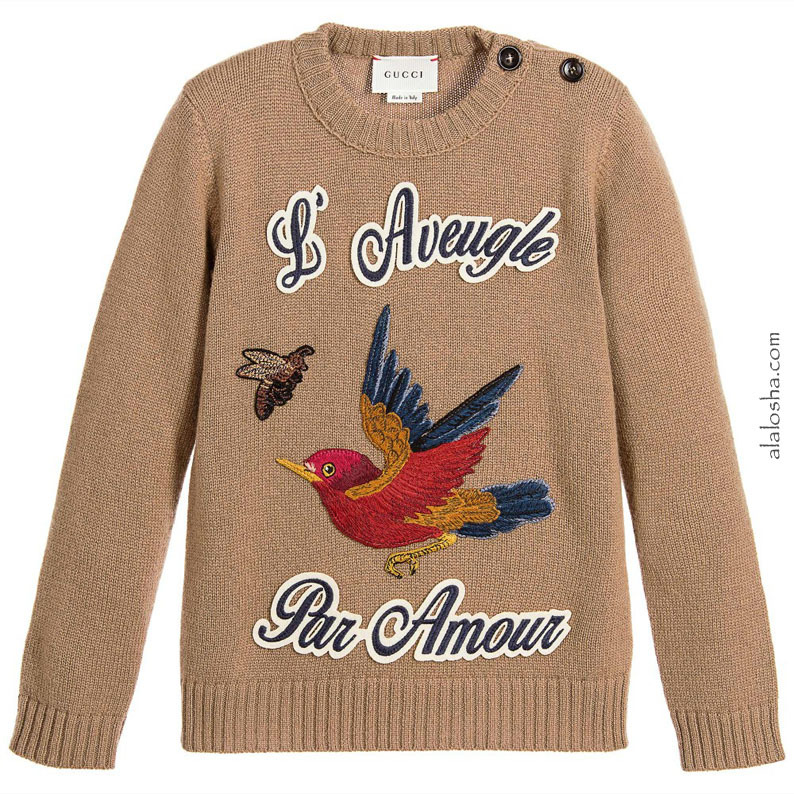 In a luxuriously soft, fine knit, this striking design has a beautifully embroidered bird appliqué, in red, blue and yellow, together with the positive phrase 'blinded by love', on the front. 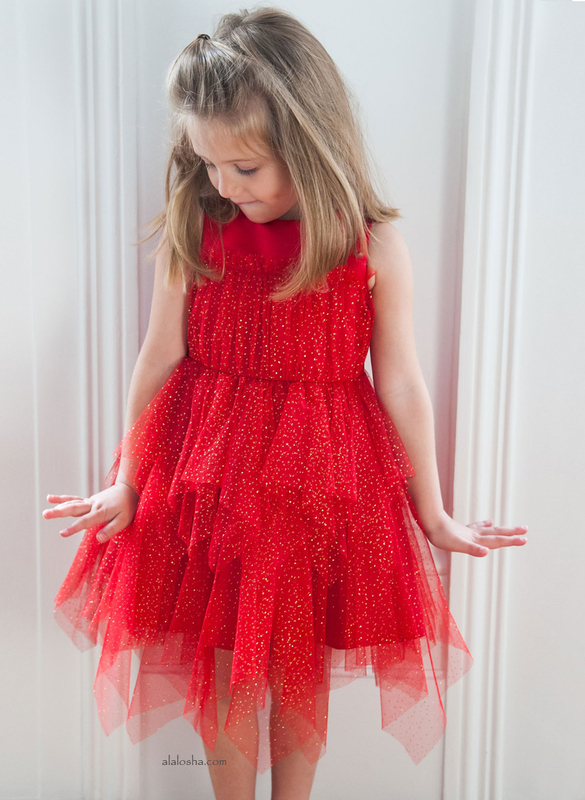 The neckline, cuffs and hem are ribbed and there are are brown, monogrammed buttons on the shoulder for easier dressing. 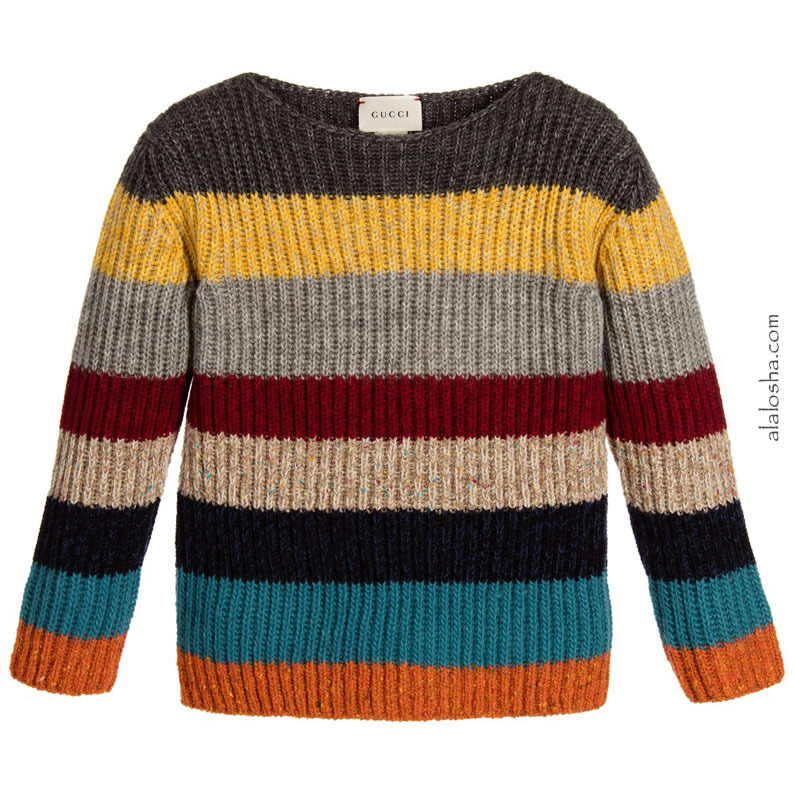 This versatile, cosy sweater would look lovely teamed with a pair of blue jeans or chinos. 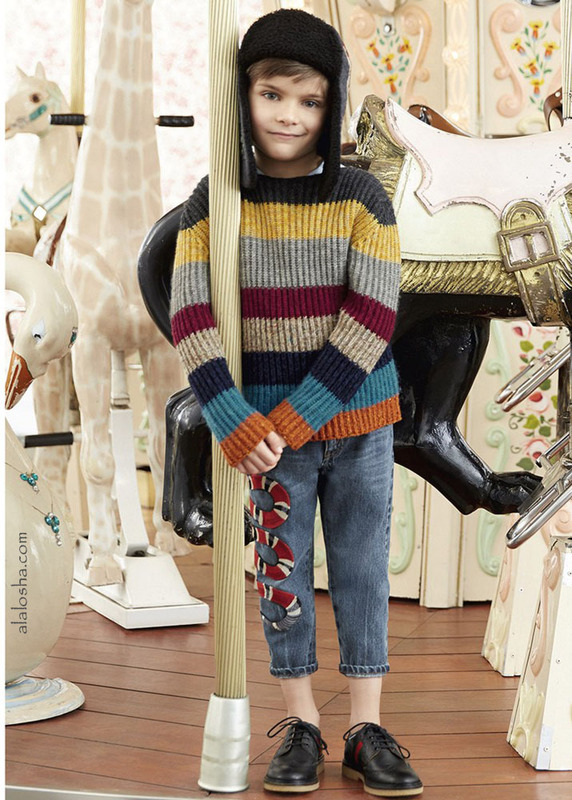 Boys colourful, striped, chunky knit, soft wool and alpaca blend sweater by Gucci. 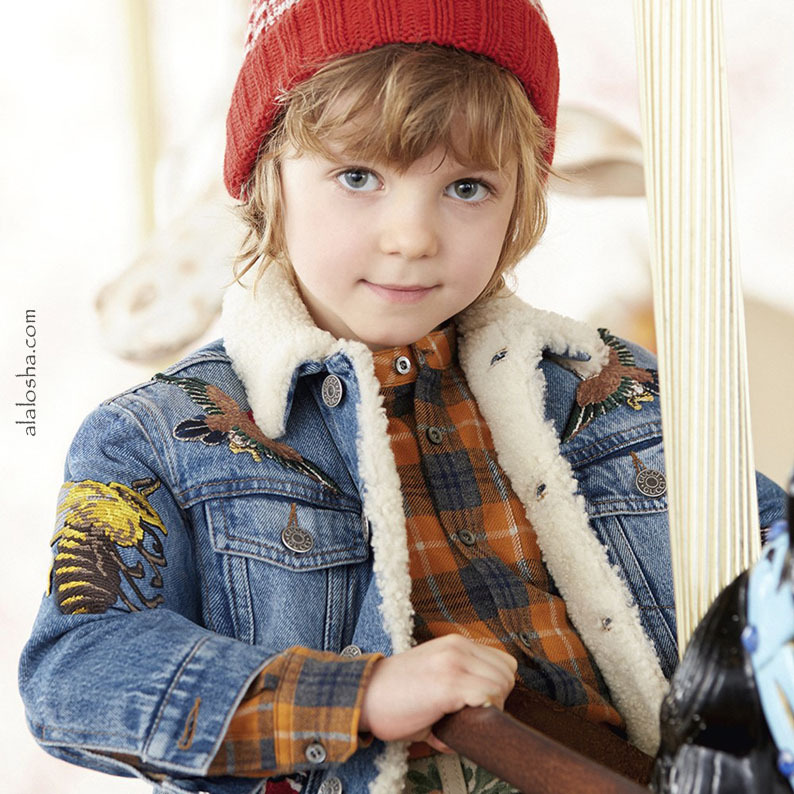 In a wide, boat neck style, the sweater is both ribbed and cosy, and will team well with many items in a boy's winter wardrobe.